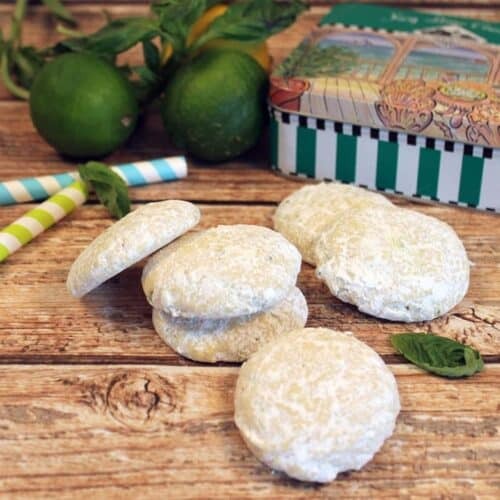 Light sugar-coated cookies, easy to make & perfect for picnics & after school treats. Adults & kids alike will love the sweet-tart combination of our Key Lime Coolers! Preheat oven to 325 degrees. Line 3 large baking sheets with parchment paper. In a large bowl, with electric mixer, beat butter with granulated sugar and 1 cup powdered sugar until light and fluffy. Continue to beat while adding eggs and extracts. In a medium bowl, combine flour, cornstarch, baking powder and salt. Add to butter-sugar mixture, alternately with key lime juice and 3 teaspoons of zest, at low speed until well mixed. At this point you can make the cookies as is, which are your traditional coolers, or you can add either the basil or white chocolate chips. Using a tablespoon or a small cookie scoop, place cookie balls 1" apart on prepared baking sheets. You can leave as rounded balls or flatten just slightly with bottom of a measuring cup. Bake in oven for 16-18 minutes or until bottoms are lightly browned. While cookies are baking, mix 1 cup powdered sugar with the remaining 2 teaspoons lime zest in a large gallon-sized plastic bag. Remove cookies from oven and let cool for 5 minutes on baking sheets then place several in ziploc bag containing powdered sugar mixture and gently toss. Shake excess off then place on wire racks and allow to cool completely.